After hearing on the radio that there was a circus in town (how old school), I insisted that we went. I absolutely love the circus!! It’s always full of happiness and I always sit in awe when I watch the acts. 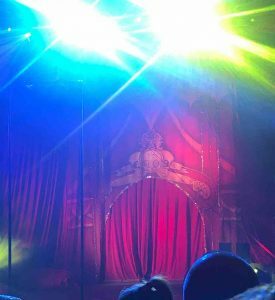 To make it better it is called The Showman Tour, after The Showman film that came out late last year which I loved. I’ve never been to a pop-up circus, only ever places like Blackpool where it is permanent. So it was fun to be able to go to a one off show that we couldn’t really return to. 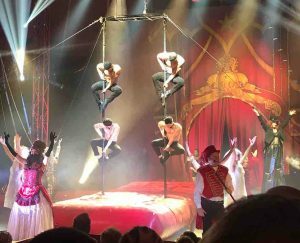 Gandy’s Circus is touring the UK and then Hong Kong when they are finished. It is a fully heated tent, which is great because we went on a very cold and wet night. We saw them at Aintree Racecourse, Saturday 10th February. The amount of shows and times of the shows vary depending on where you are going to see them, all information is available via their website. We bought our tickets from the box office (the price ranges depending on where you sit, so check out their website for details), however you can buy your tickets online or call the box office for help. There are a selection of seats at different prices, however it doesn’t matter all that much where you choose to sit because no matter where you are you have a really good view. Pre-warning it is an audience participation show, where you could be picked to perform on the stage, or throw something to the stage etc etc. Everyone was cooperative at the show we went to however I am sure if you didn’t want to join in then they will not make you. It is worth noting that even if you are sat in the middle of the row they may still choose you. The shows itself was really good, very entertaining and fun to watch. 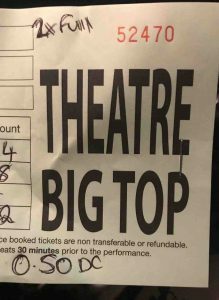 I wouldn’t want to spoil it for anyone who is planning on going, however I will say that there are dancers, a juggling act (which is not what you expect), BMX stunts, gymnastics and trapeze artists. All of which are spectacular to watch. If you follow us on Instagram then you will have seen a post whilst we were there about one of the acts. 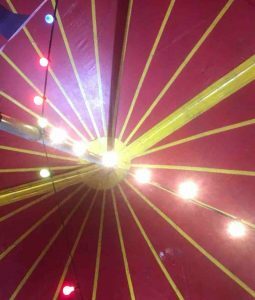 It’s common knowledge that we enjoy going to Blackpool and seeing the Blackpool Circus, we went twice to last years show and twice again at Christmas time. 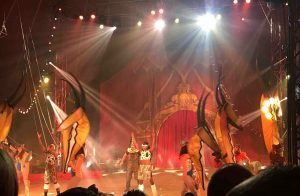 The acts at Blackpool change when the shows do as they they join other circus’. You would expect to go to a pop up circus with all the acts being new to you. Well, as soon as the first act started, we both looked at each other and realised that we had seen them before. It took a couple of minutes to definitely confirm who they were. But once we were sure we knew, we had seen them at Blackpool only back in September! This act isn’t British, in fact they are Cuban. It must have been that because they were already in the UK for the Blackpool circus that they then went on to Gandy’s Circus. It was funny, and something neither of us expected to happen at all! Though they are a fantastic act and we didn’t mid watching them again (for the third time). If you get the chance then I would recommend going! It is a fun show, with familiar songs and great acts. It makes for a really nice and different evening out. Next Next post: Not Sure What To Do?